It’s always exciting when one of our guides sends through a video clip of an ambush predator in the throws of capturing its prey. When AD Van Zyl from Chacma Bush Camp WhatsApp’d me to tell me about a unique sighting while out on drive, I made an assumption that I was going to receive an influx of leopard videos and images. How wrong I was. AD spotted the unimaginable. The type of sighting that would make herpetologists and reptile loving safari-goers turn an envious shade of green mamba! Guide AD found an African rock python suffocating its unsuspecting prey, a rather large impala. Watching a kill in progress is always a moment that elicits mixed emotions. 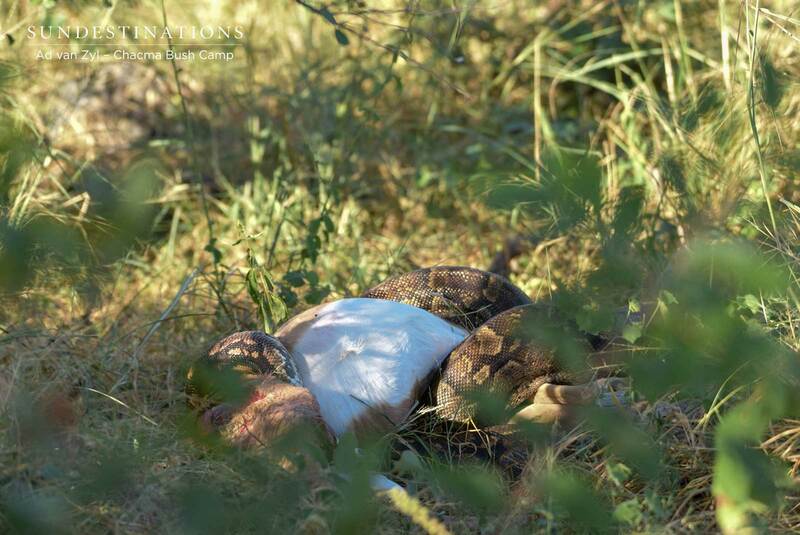 You feel that gut-wrenching pull when a placid, doe-eyed impala dies; but you’re excited that one of the bushveld’s significant predators successfully finds a meal. The rock python is the largest snake in the Greater Kruger, and can weigh up to a whopping 50 kgs. It’s a notoriously aggressive predator that ambushes small prey with great ferocity, on land and in water. That’s right – in water. Unlike other snakes, rock pythons actually love water and often remain underwater to thermoregulate. In this case, it’s prey was targeted and taken down on land. 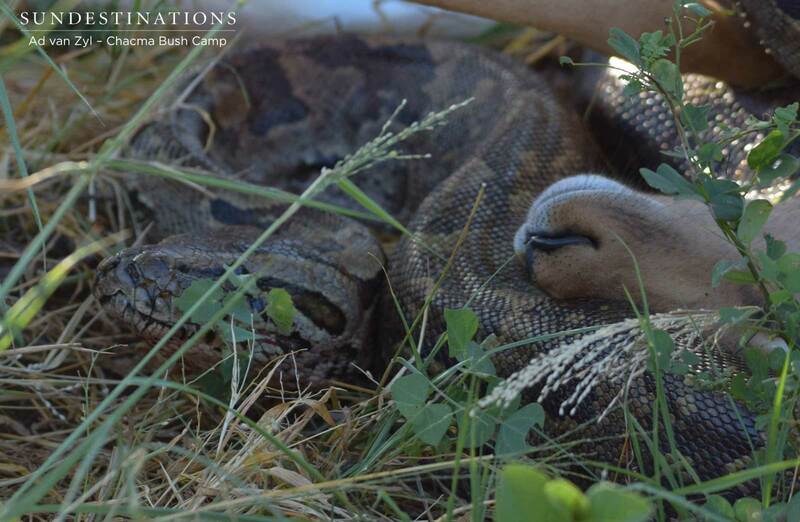 We’re quite used to seeing pythons snack on the smaller prey, but this sighting strayed from the ordinary. The size of the prey was remarkable – an impala is a common source of prey for cats! 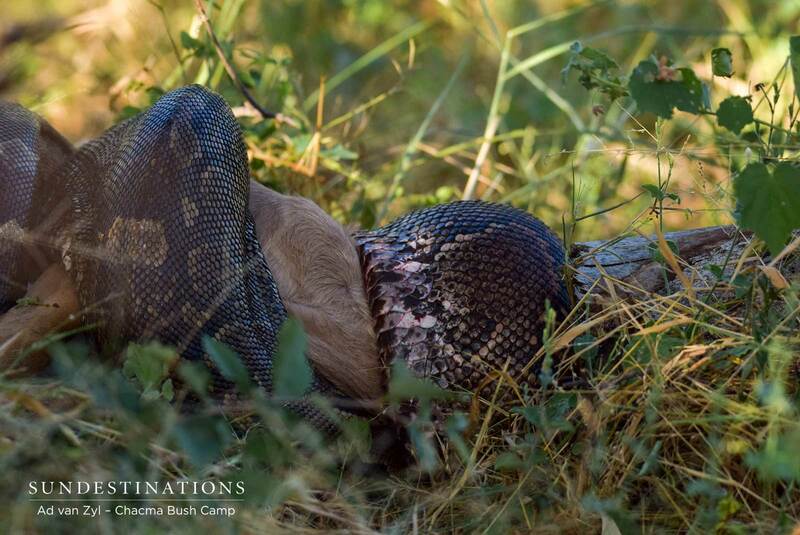 The rock python is a nocturnal hunter and uses the cover of darkness to slither around and ambush its prey. It detects warm-blooded prey with its heat-sensitive pits, and goes in for the kill when close enough. When it slithers closer, and ambushes its prey it then constricts its prey by securing its grip and suffocating the kill. It will then swallow its prey whole, during which time the snake is in a vulnerable position. Leopards are opportunistic killers and if they stumble across a full-bellied, immobile python they won’t hesitate to pounce. This sighting was considered an absolute highlight, and we’re grateful that AD had his camera on hand.